Happy Friday! I hope you’ve enjoyed your week and have some good things on deck for the weekend. 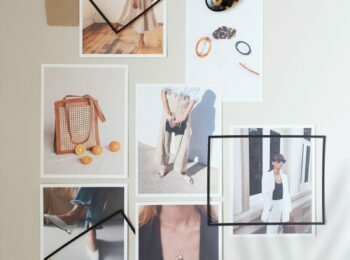 We’re planning to explore Granville Island and more of downtown Vancouver, so naturally, I’m day dreaming about what to wear on our little adventure. I can’t tell you how thrilling it is to have options that don’t involve a parka! 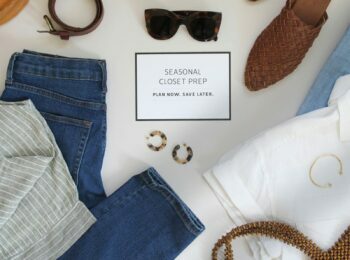 It’s been wonderful to experience some mild weather here on the west coast and has made it so much easier to enjoy Spring style for a change. 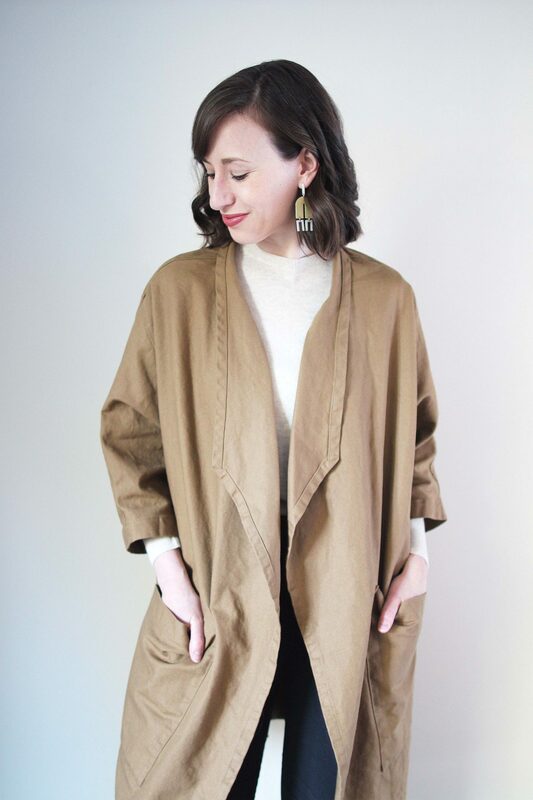 This brings me to today’s post and one of very few additions I’ve made to my closet this year, which is the Harper Jacket from Elizabeth Suzann. It was one of the latest styles released in the Signature Generation 4 collection and I was immediately drawn to the clean lines and carefully considered tailoring. Not to mention that it’s pretty much a perfect Spring coat! After sharing a few sneak peeks on my instagram I started receiving review requests so I figured I’d share my thoughts on it now that I’ve had a couple of weeks to wear it out and about. I’ll also note that this post is in no way sponsored. I bought the Harper Jacket myself and do not receive commission on sales made from links to it. I think it’s a pretty special piece and, knowing that lots of folks are interested in it, felt it was worth sharing any insights I have in case you decide to order one. So let’s tuck right into today’s post! 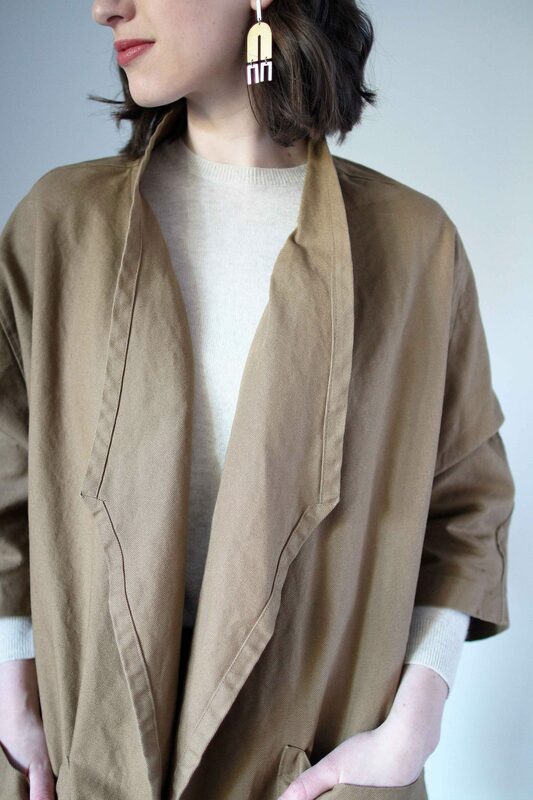 I’d originally purchased the Clyde Trench in Khaki in a size S but found it was just A LOT of jacket on me and I wasn’t loving the khaki colour next to my face. It wasn’t awful, I just felt it made my skin look a bit sallow. 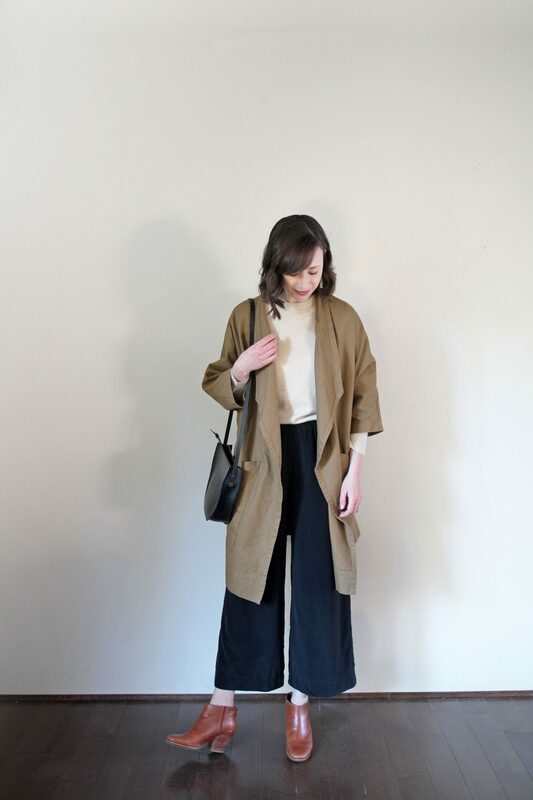 I really wanted to love it so kept the Clyde Trench in my closet for a while and would try it on every few days to see if my feelings towards it had changed. Ultimately I had to accept that it just wasn’t working for me. 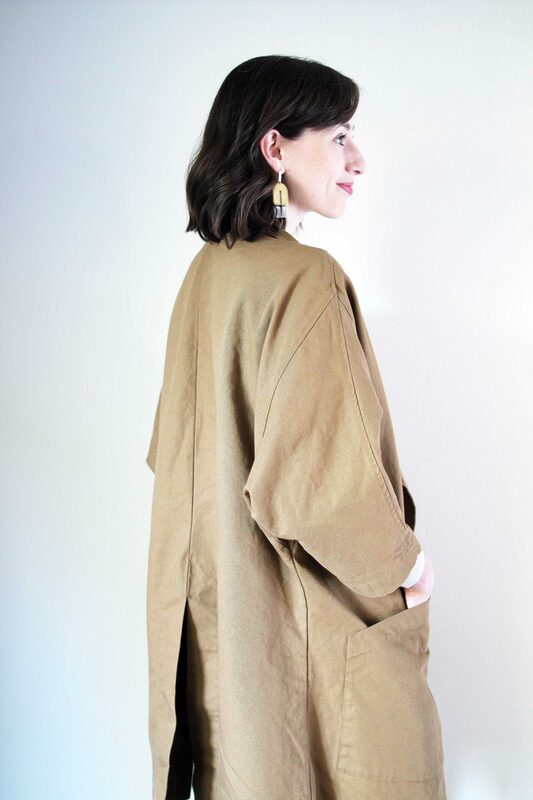 I’d resolved to send the Clyde Trench back when a sneak peek of the Harper Jacket was shared in the @elizsuzann stories and my interest piqued immediately. This was what I’d been looking for! I loved the menswear inspired cut, contemporary take on lapels, sharp edges and the slightly less overwhelming shape. It’s a statement piece for sure but in an easy-going, understated way that seemed very wearable (and is!). I could instantly imagine it with all my existing ES pieces along with my cashmere sweaters, straight crop denim and ribbed bodysuits. So, I asked if I could exchange my Clyde for the Harper and the ES customer care team was super accommodating as always (shoutout to Kaitlin!). I opted for the clay cotton canvas instead of khaki and I’m so glad I made the switch. Read more of my thoughts on the Harper Jacket below! DESIGNER: Elizabeth Suzann. 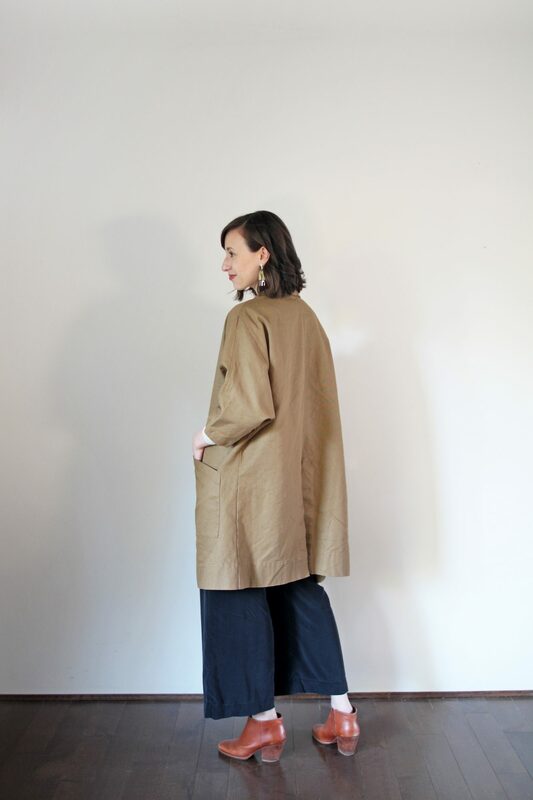 If you’ve been reading Style Bee for long you’ll likely know that Elizabeth Suzann is one of my all-time favourite responsibly made clothing brands. The collections are timeless, the designs are meticulously thought out, contrary to how easy they are to wear, every piece is made to order under one roof in Nashvill and the team is AWESOME. I could honestly go on for ages about this line but for now I encourage you to explore the stories behind what they’re all about here if you’re not already familiar with Elizabeth Suzann. PRICE: $265 USD. Shipping is always free worldwide. Canadian shoppers: I was not charged customs on this order but I have been charged on ES orders in the past. It’s hard to know exactly why, when or how much you’ll get charged for customs/duties but it’s typically around 20%-30% of the product value listed on the shipping label. SIZE: I ordered the OS Minus. For reference, my measurements are 32 B / 26 W / 37 H and I’m 5’7.5 tall. This piece runs quite large so I would definitely recommend sizing down. FIT: The OS Minus fits just as I’d hoped. Nice and roomy but not overwhelming. My measurements indicate that the OS Regular would be a good fit as well but I think I’d end up feeling as though I was swimming in it. 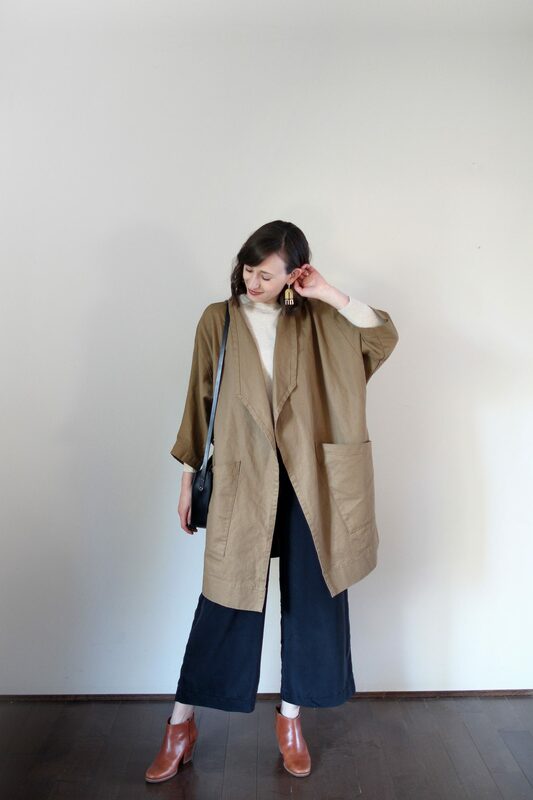 Petite Folks: I’ve had quite a few questions about this coat from folks under 5’4 and being 100% honest, if you’re petite and don’t love oversize pieces this might not me the best coat for you. I’d go for the Clyde Jacket instead as it’s offered in more sizes and isn’t as long. That said, if you love it, go for it! CARE: Machine washable. Wash on cold, tumble dry warm. Press on low with steam to remove wrinkles, or leave unpressed for a perfectly unfussy look. Cotton canvas will break in and soften significantly over time. Cotton is a natural fibre and will fade and wear over time. If you prefer your garments to not show as much wear, hand wash and do not tumble dry. 1 | Warmth | I wanted this coat to have as much seasonal longevity in my closet as possible so the canvas seemed like the way to go since I can layer under it on cold days and it’s still light enough to wear in warmer weather. I’d say it’s temp capacity runs between 5°C (with a couple of warm base layers and a scarf) right up to 25°C (over a silk tank dress for a breezy day or dinner outside). 2 | Durability | This coat feels like it can take a beating, literally. It was quite stiff when I first got it but has already softened up with wear so I know it’ll just keep getting better with age. I can wear it to walk Dobby in the park and not worry if he jumps up on me with muddy paws (spoiler alert: he already did!) or if we end up walking through the woods and have to deal with low branches. I treat all my clothes with respect but I wanted a jacket that I could feel a bit less precious about. 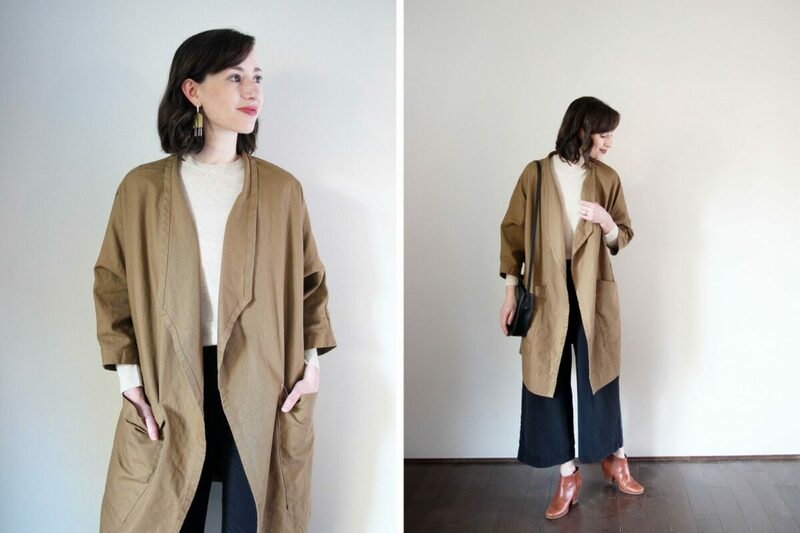 3 | Low Maintenance | You know I love linen, like, I really love linen, but for this coat I didn’t want to have to worry about wrinkles and creasing. It has a casual, worn in feel but it holds it’s shape really well and maintains a tailored and structured look, which I really like. When it arrived it was quite creased from being in a box but after hanging up all night most of the lines fell out and after one or two days of wear it was smooth. I didn’t even iron it for this post, which perhaps you can tell. Truth be told, I really love the linen version too and may end up adding one for the summer but I’ll wait to see how much this jacket gets used first. COLOUR: I really waffled on the colour of this coat but ended up going for the Clay. I do think the Khaki is ultimately more timeless but as I said, I didn’t love the Clyde Trench in that colour. I was very tempted to try the Natural but knew it would probably get dirty on dog walks and I wanted to be able to wear it around job sites with Dave and not be afraid to bump into anything covered in dust and dirt. The black is of course super chic but I have my black cocoon coat in boiled wool, which has a similar shape and it didn’t feel very Springy. I’m not much of a navy person but I do think it’s a great option for anyone who is! This clay colour is a unique one in my closet and I was a little unsure of how well it would work with my other pieces. As it turns out, it’s so easy to pair with most neutrals and I LOVE it with black and white (so most of my clothes). It’s definitely a unique tone because it’s not brown and it’s not olive but it falls somewhere in between. It also looks SO different depending on the light you’re in. In the bright daylight it’s almost green (see what I mean here) but indoors (where I shot today’s look) it’s almost a camel colour. Quite the closet chameleon! I’m still playing around and seeing how much I can pair it with but for now anything neutral is a safe bet. 1 | SLEEVES: The dolman sleeves on this jacket make it a breeze to layer over any sort of top. They’re nice and wide so you don’t have to worry about scrunching your base layer into them, while at the same time they taper to a closer fit on the arm so you don’t have to worry about dragging your them through things as you might with a kimono style sleeve. Additionally, the seam that runs over the shoulders extends down the entire arm. This helps it fall really elegantly over the shoulder. As you might know I’m a big fan of layering my sleeves so that the cuffs of my base layer peek out under what I’m wearing on top. This just adds a nice touch of dimension to the look. The Harper sleeves were designed with that very trick in mind and the cropped length makes it easier than ever to put together a thoughtfully styled outfit with minimal effort. With a long sleeved sweater underneath I leave them as is but could just as soon roll the cuffs to expose a bit more of my base layer if I wanted. 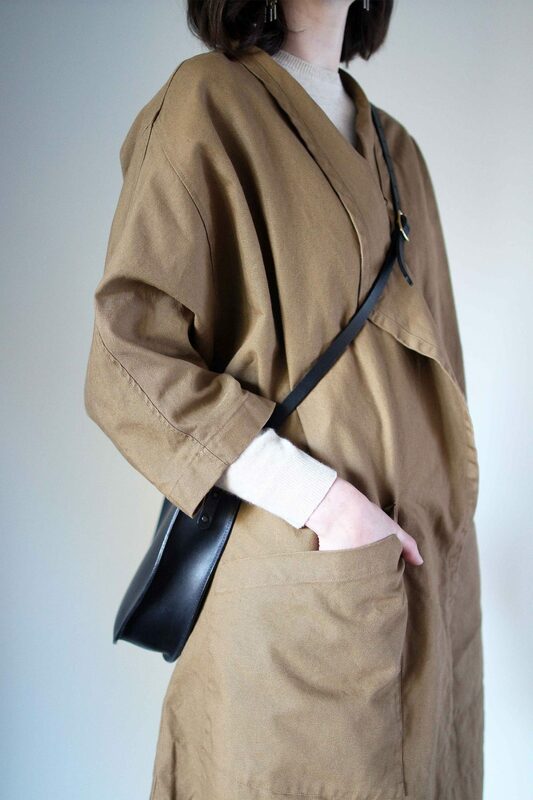 Note re: bags: Because the sleeves are dolman style and quite wide at the shoulder I’ve found my long strap shoulder/cross-body bags work best. My tote bags with shorter handles don’t glide comfortably over the sleeve so I have to carry them in my hand instead. 2 | COLLAR: The collar was what really sold me on this piece because it’s reminiscent of a blazer lapel, and I think we know how much I love blazers! I prefer it folded down and it naturally wants to fall that way but I’ve worn it up too and that gives your neck an extra bit of protection from cold or wind. 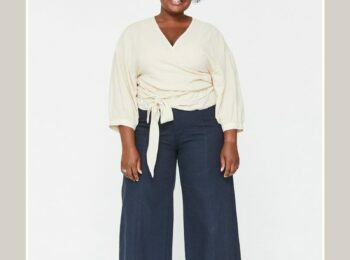 The relaxed lapel is such a great touch because it works with so many necklines and can be worn over a simple crew as shown or over a collared shirt, turtleneck and looks chic as heck over a boatneck! When I was trying out ways to style the Clyde Trench it felt like a lot of material around my neck and shoulders, whereas this does not at all. 3 | BACK VENT: This might not seem like an important design element but I think it’s genius. I love the deep open vent on the back of the coat because it gives the coat lots of movement and keeps it from feeling heavy or cumbersome. This also let’s light in and when you walk the opening gives glimpses of what you’re wearing underneath. The best part about the back vent though? It makes it so easy to hop into your car and drive in! I don’t know about you but I hate when my sleeves feel too tight because I’m sitting on the back seam of my coat and I find myself shifting and adjusting things. This definitely helps with that! 4 | POCKETS: Maybe it’s just me but I’m one of those people that doesn’t always feel that pockets are necessary. Or shall I say the function of a pocket does not always outway the form of a piece. Meaning, I know they’re useful but if they look bad, no thanks. But in this case I’m more than okay with the pockets, actually, I’m a fan! I don’t feel that they take away from the simplicity and elegance of the coat because they’re fairly sleek and don’t add much bulk. They are SUPER convenient and Dobby will confirm that they’re 100% necessary for treats, whereas, I will say it’s nice to have somewhere to throw my phone, lip balm and credit card when I don’t feel like bringing my bag! The subtle angular detail of the pocket shape is flattering and works beautifully with the jacket’s lapels. The pockets also wrap around the side too so you don’t have too many seams visible from the front at one time. 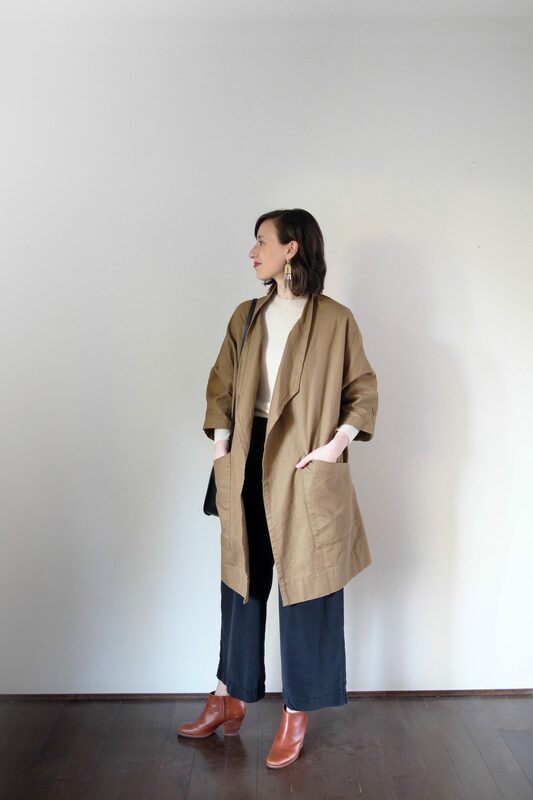 I often get questions about how I wear open front coats when it’s windy and that is such a valid question! I use the same trick almost every time, which is to overlap the front panels as much as I can, then I wear my cross-body bag overtop to hold it closed (shown above and below). Works like a charm! This coat could also be belted with something like this (plus, ES is coming out with belts soon!) or a belt bag (yay hands free!) or you could pin it closed with a sculptural broach like this one. I’m giving the Harper Jacket a 9/10. 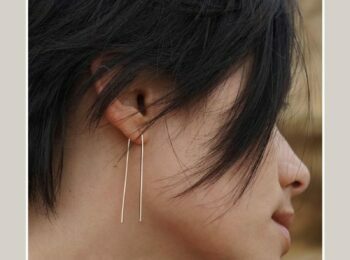 I’m very glad I invested in this piece and look forward to experimenting with different ways to style it this Spring. I would have given it a 10/10 if the fit was more true to size but perhaps they’ll work that out in the future. If you’re loving this piece I say go for it! 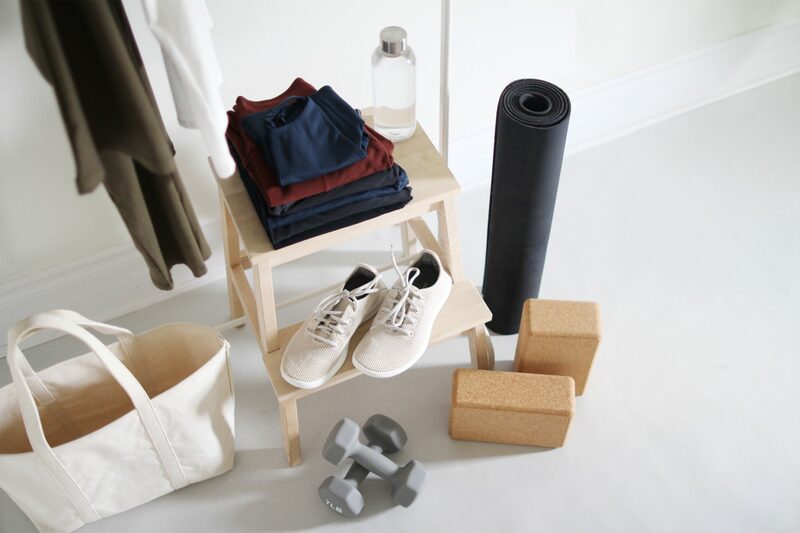 It’s showing all the signs of being a closet workhorse and it’s a killer piece for creating a standout look that’s elegant and still totally wearable. So there you have my thoughts on the Harper Jacket! I hope this info helps anyone who’s been interested in it and please feel free to leave any unanswered questions below! 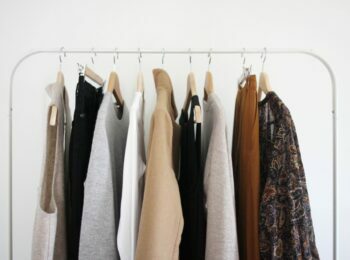 CASHMERE CREW | Everlane | Many colours available | $100 USD | Made ethically in China. BOOTS | Rachel Comey | Love the Mars Boot style and also have them in Black. | Runs TTS but narrow in my opinion | Made in Peru | $425 | This boot is a similar shape in a glorious rust suede for $225 USD. I had my eye on this jacket and now think I must have it! Thank you for the review. I ordered the Harper in navy linen a month ago but did not receive it yet. Now, I am rethinking my order. And I have a question. How much of overlap (in inches, if possible) you have when you lightly close the jacket around your frame. I am the same height and 2 inches bigger in every circumference than you: 34 B, 28, 39. So, should I get OS- or OS? I hate potato-sack fit but I do appreciate the thoughtfully architectural oversized fit. Any details on how roomy your Harper is would be helpful. 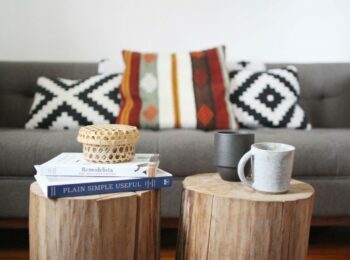 Love the Harper on you and how you’ve styled it! Coincidentally I ordered this same coat yesterday (same color/size too). 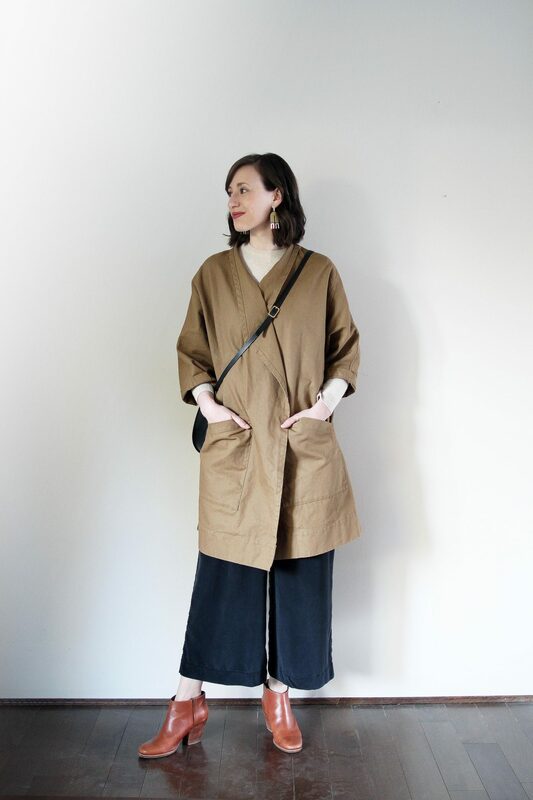 I am petite (5’1”) but I wear oversized pieces all the time and I see this as a substitute for a trench on me. I love the look of oversized sculptural Japanese designs and I’m hoping this piece will have that feel on me. 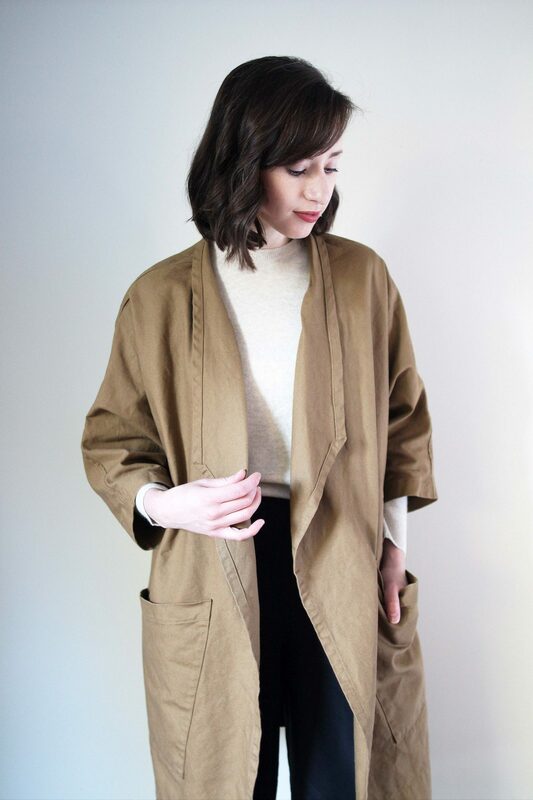 I love the longline look of a trench but I’m curvy so I feel most trench coats are too tailored & bulky on me. Also most khaki or tan colors don’t look good with my coloring. I think the clay will be perfect and I’m crossing my fingers that the shape of the Harper will work the way I think it will on me. 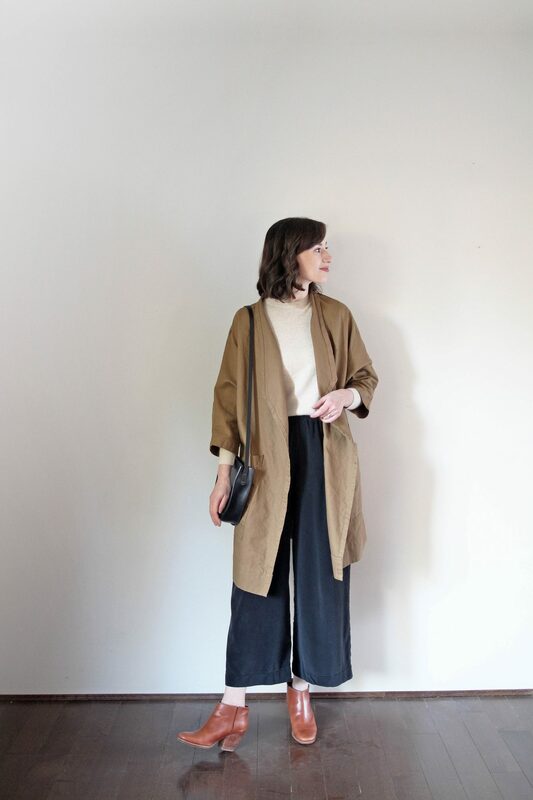 Great review – thank you – I love the way you styled the coat. And so glad you’re enjoying wearing the coat in the lovely weather the West Coast is having (at least this week!). Will you do a review of the l’Envers sweater sometime in the next little while? Thanks so much. Love the jacket on you! You have such a well thought out and beautiful blog. I love your reviews! I will say though in regard to your suggestion to size down- i think it all depends on the width of your shoulders. I have the same measurements as you and I ended up getting a OS plus!! The OS was a little snug on my shoulders and I don’t have very broad shoulders-But I know it’s nearly impossible to suggest a perfect size for every body! Thanks for this in-depth review! I think you’re right – it would definitely overwhelm us ladies who are under the 5’4″ mark. The note about the back vent is eye-opening; just curious what other pieces you’ve stumbled upon with that feature, as it’s not one I see often. Love the Harper Jacket!! I agree — this piece may overwhelm petite frames. So glad that ES reworks their items based on customer reviews. It’s by no means a guarantee that the sizing of the Harper Jacket will be updated, but it is not outside the realm of possibility. I’ll keep my eye out in case it happens in a future relaunch! Gorgeous! The lines of the jacket remind me of origami folds. Love the way you take note of details and the impact they have on style, fit, & ability to be a “work horse” in your closet! A “charmer” piece on you! Looks fabulous on you….in all ways including your hair style & color! Mmmmmm? So what weather/seasons will it work? Spring-summer-fall in Northern Minnesota? I am thinking it will. I might have to put this on my list! Have a fun weekend adventure? Love the cut of this jacket, Lee, and it fits your sophisticated but easy/calming/chic style perfectly. 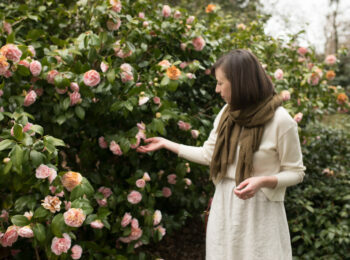 It sounds like a nice turn of weather events + life events for you to be able to wear lighter clothing like this! Also, I am now going to look for jackets with back vents, now that you mention how they keep you from feeling restrained when you sit. This is an absolutely stunning outfit – thank you for introducing me to this designer. I am thrilled to see she has talls in those Florence pants too. I love your posts! Thanks for this review, Lee! I’ve been thinking about this jacket or the Clyde but was waffling on colour because the Clay seemed right but also it’s such a hard colour to judge on screen, so more photos in different light has been great! A note re: customs. Thanks to NAFTA (for now…), there are no actual duties on imported clothing made in the USA. However, you do still have to pay provincial + federal sales taxes, which is what gets charged on orders from ES (or other US clothing makers) when border services decides to look at your package in particular. That means you can calculate it ahead of time to budget for it, though it will vary depending on the exchange rate at the time CBS looks at your package (since it will list the USD value and they’ll calculate the CND). So in Ontario, 265*1.31*0.13 = $45, which is approximately what the duties should have been on just this coat. I always assume I’ll pay taxes and add it into my budget and then can be pleasantly surprised when I don’t get charged. My pleasure Hilary! THANK YOU for this customs/duties info. I found it hard to find concrete guidelines about import fees, esp with all the NAFTA negotiations happening. That formula is so helpful and I really appreciate you sharing that with us. Do you know if US goods made from imported materials (ie: China, Europe) are also exempt from duties? No problem! I live in Quebec so with 18% it can be quite the unexpected whallop even if sales taxes are usually not a surprise. I don’t believe the material origin is what matters, only the location of the final manufacturing of the good.